ViewSonic Corp., a leading global provider of visual solution products, will announce its newest innovations at Computex 2014 including VDI products, price-competitive 4K Ultra HD devices, ultra high resolution and SuperClear® wide screen LED displays, the whole new digital signage series and projectors with the exclusive SuperColorTM technology that aligns with today’s consumer expectations and business/education demands. 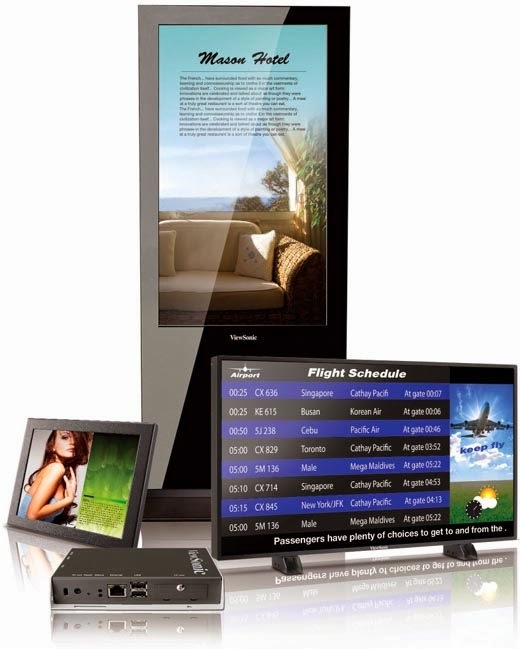 Digital Signage: ViewSonic’s easy-to-install and maintain commercial displays range in size from 10" to 84” for clients to advertise, promote, and broadcast to customers. Most videos formats, web pages, PowerPoint files, Flash animations and other HD content can composed, scheduled, and delivered for the dynamic playback via build-in networks or remote control. Besides, ViewSonic will unveil a smart whiteboard SWB8451. With this 84” 4K Ultra High-definition large-format display, the high-definition multimedia contents can be explicitly presented in greater detail. Its 3840 x 2160 pixel screen contains over 8 million pixels, which is 4x more than Full HD display, all image details are clear, vivid and larger than life. With the unique edge border design that redefines the relationship between the bezel and panel, in particular operating under Windows 8, there are no more dead angles. Presenters now have more options and Windows® 8 apps to choose from. Now there is greater access to various education applications, including storytelling, math-related and language testing programs and more. Your students or audience members will surely benefit from the productivity and interactivity that this offers. ViewSonic’s Smart Client solutions enable users to access their desktop accounts from nearly anywhere via a centralized server, and helps a business fully transition to its VDI strategy. The new zero client SC-Z55 is ideal for users seeking the richest possible virtual desktop experience. Certified for VMware® Horizon View™, this highly secure zero client supports advanced 2D/3D applications and can drive up to four simultaneous full HD displays. Based on the Teradici® Tera™ 2321 chip platform, this new zero client provides the fastest most efficient virtual desktops possible in a VMware® View™ environment. The SC-Z55 is ideal for high-end workstations, investment traders, or any users requiring displays, maximum workspaces, and higher productivity. The ViewSonic SD-Z245 24" (23.5" viewable) Zero Client monitor is the perfect solution for companies seeking a seamless desktop experience. ViewSonic’s SD-Z245 is equipped with the most advanced Teradici Tera2321 processor designed for VMware based virtualization. This powerful processor delivers up to 5 times faster performance, up to 50% lower power consumption, and supports 2D/3D graphic intensive applications for a rich multimedia experience at full frame rates over gigabit Ethernet. The Teradici PCoIP management console provides for simplified and secure centralised deployment and management. With web based access, administrators will be able to configure, update, manage, and even remotely control the power state of all their PCoIP based zero clients throughout the network. With its DVI-I digital or analog outputs, the SD-Z245 provides for dual-display productivity when connected to a secondary 1080p display to increase productivity . The VX2880ml brings Ultra HD 4K2K resolution to desktop computing: The VX2880ml comes with stunning 3240 x 2160 resolution and 50M:1 MEGA Dynamic Contrast Ratio. It is equipped with HDMI interface and supports for MHL connection. The two built-in stereo speakers provide superior audio quality. Owing to its high resolution and large size, it delivers sharper and delicate image performance with more content. It is ideal for home entertainment and office work to view high resolution pictures and 4K movies. VX2363Sml – A whole new high performance Full HD SuperClear® ultra wide viewing display to deliver wide viewing angle and true color consistency: Equipped with SuperClear® Technology pioneered by ViewSonic, it delivers amazing, lifelike images and true colors which are beautifully replicated on the screen and can be viewed from almost any angle. The brightness levels are consistent across 178-degrees of vertical and horizontal viewing angles without image distortion and color shifting to ensure true, lifelike color. 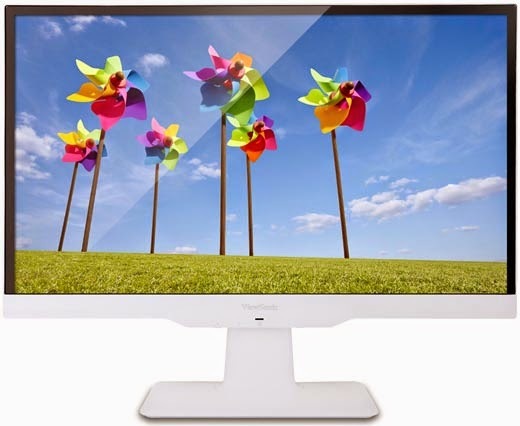 ViewSonic VX2363Sml is 23”high performance Full HD LED display with frameless bezel featuring an elegant and glossy finish. It features Full HD 1920 x 1080, ClearMotiv II imaging technology, MHL connection support, 2 x HDMI inputs, 2ms ultra-fast response time, and ViewSonic’sGame Mode, to deliver more clear and accurate images quality when browsing web pages, watching movies or gaming. The VX2363Sml features a 100 x 100mm VESA-mountable design that allows you to mount the display on a monitor stand or on a wall, depending on your specific needs. ViewSonic’sproprietary Eco-mode function comes standard with the VX2363Sml display to save power consumption and make it ideal for home entertainment or office work. Equipped with SuperColor™ Technology, ViewSonic projectors provide outstanding features to offer a better projection and user viewing experience, as well as superior image quality. Users can now project anywhere, anytime without any color tradeoffs. A built-in ViewMatch®color mode optimizes the color gamma to fit most projection environments without sacrificing image color quality. 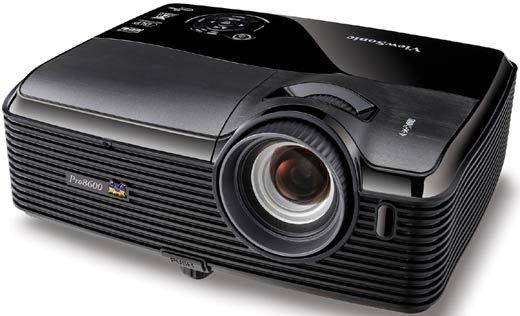 The features of SuperColor Technology, which includes exclusive 5, 6 and 7–segment projector color wheel designs, advanced digital image processing, and dynamic lamp adjustment technology, allows ViewSonic projectors to reproduce accurate, natural and vividly clear images with expanded color space. With the support for 1080P high resolution and 3D Blu-ray, the user can enjoy true-to-life color accuracy in everything. ViewSonic will showcase its new product offerings at Visual Experience Center of ViewSonic Corporation in Chung-Ho, Taipei, Taiwan. *Disclosure:An important note, we are just sharing this information to the public, provided by our source. ViewSonic Info / Logos / Photos / Images have respective copyrights.